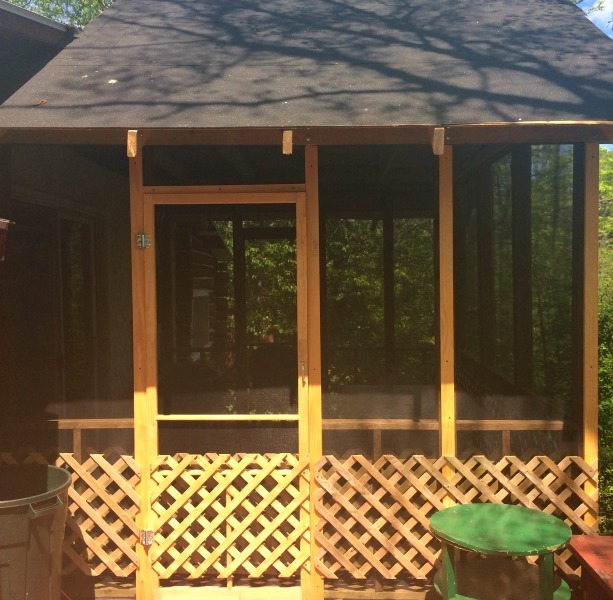 NEW IN 2016: Screened in porch, Satellite TV + all new outdoor furniture, lounge chairs and tables. Escape the ordinary vacation. Relax or be adventurous. Fish your heart out! Take a break from technology. 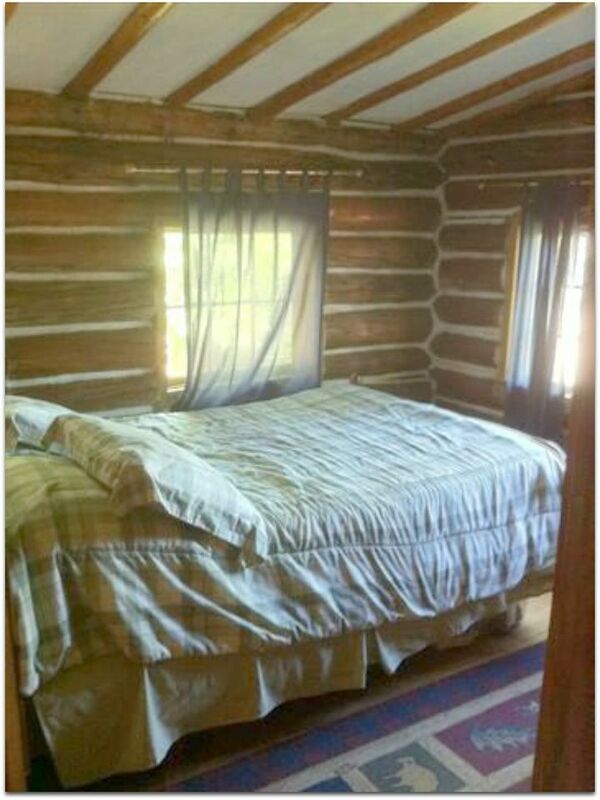 This historic (1800's), 3 bedroom, cedar log cabin is nestled within a 2 acre rustic private island on the Michigamme River. Flexibility is key. Electricity, running water, a land-line phone, satellite (Direct TV) + VCR/DVD and WiFi internet are some of the creature comforts on this rustic island. Enjoy the wildflowers and wilderness. Rustic Decor throughout. High beam ceilings. Kitchen, breakfast bar, bathroom with shower, plus a gorgeous natural wood-burning cobblestone fireplace warms the living room. Linens and towels provided. An open mind and flexibility are keys to fun here. The island is only Water-access only. Be your own captain! One of our boats will be waiting for you, as you venture off to the Island. A Jon boat (best in low water), pontoon**NOT guaranteed (best in high water) with electric motor, canoe, aluminum boat are all provided for your sole use during your stay. We try to keep all the boats running at all times, yet Spring and Fall are the times that it is most challenging. If you need a specific boat (i.e. pontoon) to have the fun you dream about, then the Island may not be your best choice. Flexibility is not just nice virtue, yet a necessity. Off-street and alongside road parking. 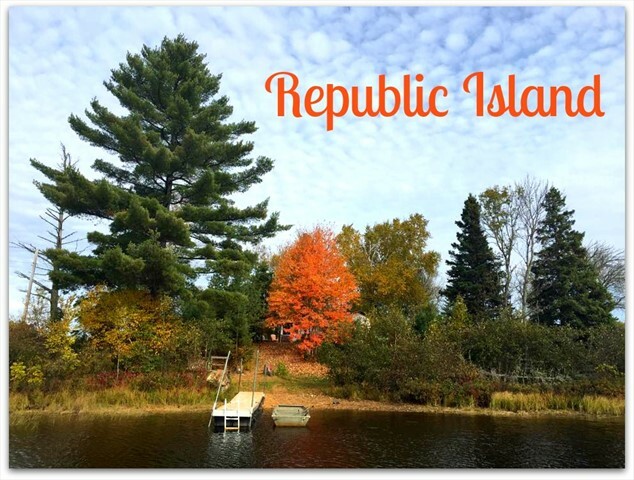 Republic Island is the home of excellent fishing, bird watching (a bald eagle nests nearby), and canoeing. Requirements for Island: You are able-bodied enough to be able to drive/row the boat/canoe, if needed. Plus you should have decent agility to walk up and down the uneven walkways. A positive, flexible attitude is essential for a good experience. As a Special Education teacher by trade, I wish we could find a way to accommodate all abilities in the Republic Island experience. While you do not need to be an athlete, at least an average level of agility is definitely required in order to have a positive experience for you and your family. Animals: Yes, there are all kinds of animals that like to roam around the island. While you don't see most of them, you have to be someone who is comfortable in that true rustic, outdoorsy environment. This is not Disney World. We have seen snakes (non-poisonous), mice, squirrels, otters, beavers, skunks and a raccoon. You are on a secluded parcel of land. While we haven't seen any moose, deer or bear actually on the island, it's not an impossibility. We do our absolute best to keep all the critters away and out of the cabin. We do not use Decon within the cabin due to pets and children being part of our family of guests. Fall is the biggest challenge as the little critters, including mice, are looking for a warm place to stay the winter months. We are vigilant about keeping critters at bay, and are always open to suggestions. 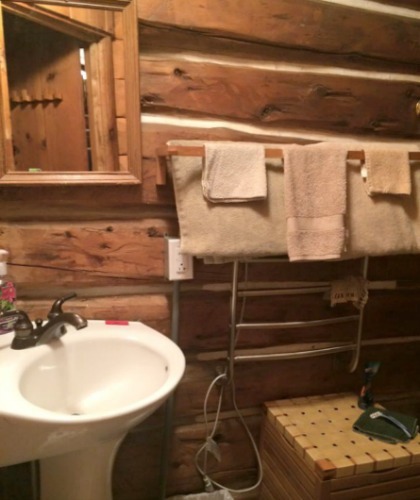 Bathroom: Even though the Island is rustic, we do have a normal toilet and sink with a neat shower that has you surrounded by the logs of the 1800s. We even have a wonderful, heated floor in the bathroom. The bathroom has the historic drain slope of the room, which was customary at the time of new, indoor plumbing, though we have tried to maintain the historic feel. Beach/Swimming: There is NOT a traditional sandy beach around the Island. Personally, I truly wish there was a way to make that happen. We’ve done our best to create a peaceful experience, yet being on a flowing river, there isn’t a simple way to maintain a sandy beach. My apologies. We recommend that people head into town (2 miles) to enjoy the sandy beach area in Republic when they want to swim in a traditional way on a beach. Plus, to be honestly, the river bottom is generally muddy, so it isn't the ideal place to enjoy traditional swimming. If you are an excellent swimmer, we do enjoy taking the pontoon boat out into the middle of the river, with the 1-2 mph current, jumping in and swimming around, yet I wouldn't recommend that for anyone who isn't a strong swimmer. The middle of the river is 20 feet deep. Boats: Ideally, basic boat knowledge is needed for the island. Still, a ton of patience, a flexible attitude and sense of humor can make it work as well. Generally the SPRING and the FALL are times where pontoon boat use is limited. There will be at least 1 boat available for your sole use, and we have up to 4 boats that may be available. I'm sorry, we can not guarantee which boats will be available for your use during your stay. 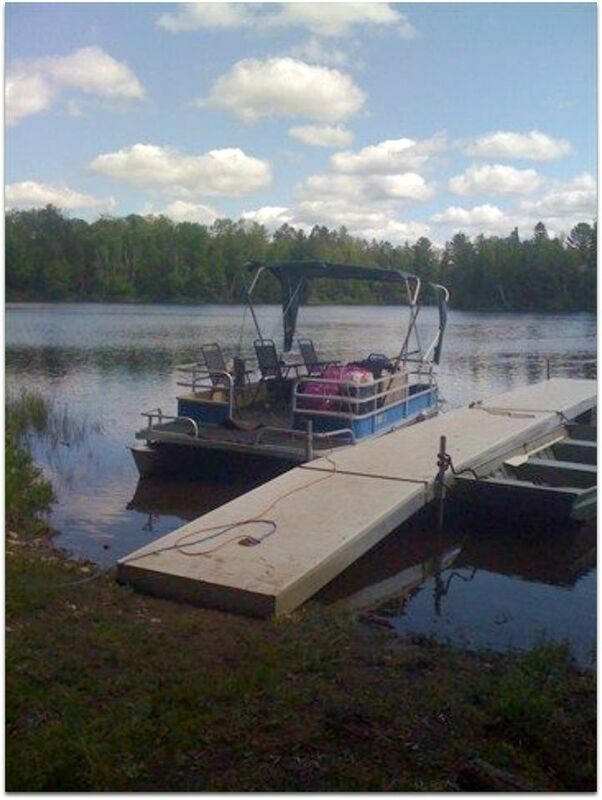 We do our absolute best to keep the simple pontoon (with lawn chairs) up and running at all times. Fixing or replacing anything on the Island is a challenge. That is also the excitement of being on an island. We always do our best. We require flexibility There isn't a key. We use a prop instead of keys. The pontoon isn't fancy at all. It functions like a floating barge. Considering bringing your own boat? Bring an extra dose of patience and flexibility. There is a gravel launch within 1/2 mile and a nice cement launch 2 miles away, right off of MI-95. 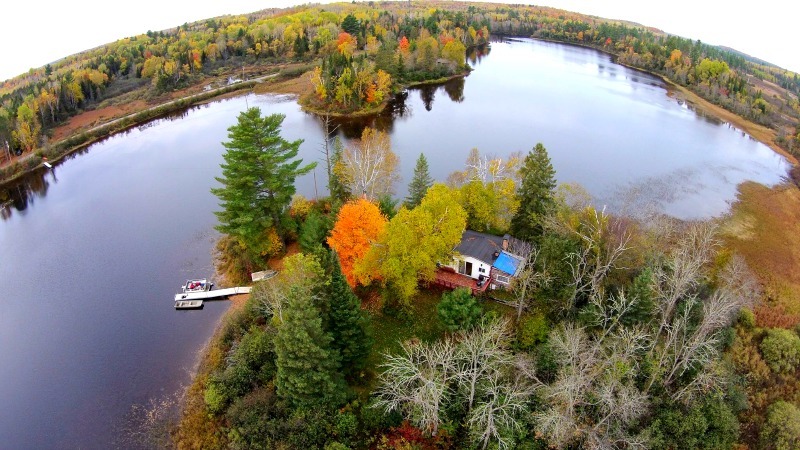 The Michigamme River is quite rocky, and we've lost a few motors + props in the past 10 years. That is why we only have a simple electric motor on the pontoon. It all depends on the fluctuating water levels. Sometimes your navigation skills are not enough, as the rocks seems to creep up as the water fluctuations are a natural occurrence. We normally have 4 boats for your use during your stay, though at times we have to pull various ones due to the water levels. The jon boat is always our trusted simple boat. ATV's: closest official snowmobile trail is 241, approximately 1.5 miles from the island. Bugs: Yes, there are bugs on the Island. There are mosquitos. The Island vacation is not for everyone. It is for true outdoorsy guests who are flexible and love an adventure, while enjoying many of the amenities of an historic cabin. We've added a screened in porch in 2016 to allow our guests to enjoy the Island scenery, while limiting the impact of mosquitos. Cell phone service: Cell phone service is generally unreliable in the Upper Peninsula when you travel outside of Marquette and Escanaba. 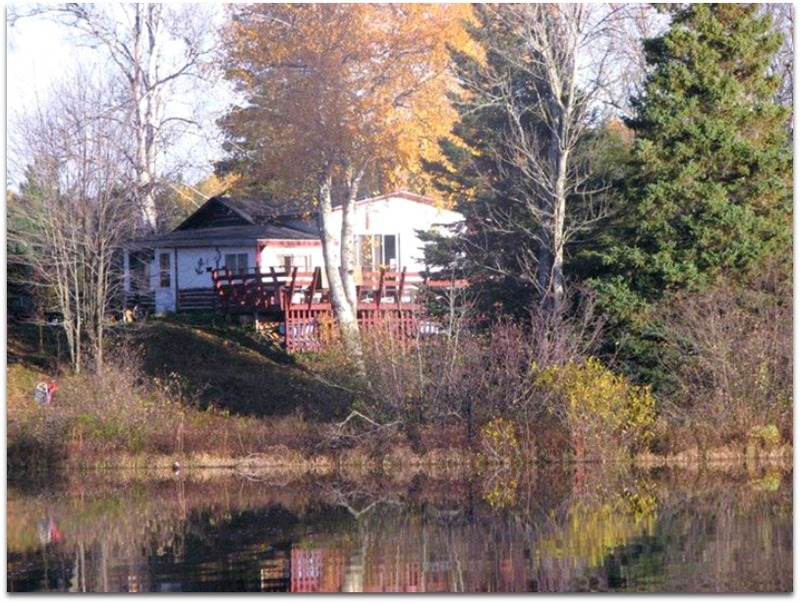 Therefore, we have a land line at the cabin with unlimited local and long distance service for your use. We also have WiFi, if you have an iphone, facetime audio is a great way to use your phone if your service isn't strong or nonexistent. Children: Our experience has been that kids either absolutely love or hate the Island experience. The kids who can entertain themselves, don’t need TV or electronics for fun and love the outdoors (especially fishing) think they are in heaven. It’s the best trip of their lives. On the flip side, I’ve had even one parent leave early because her kids were so bored and therefore she couldn't’t relax. Plus, they were scared of every sound and never wanted to leave the cabin. When they found out that we only had 3 channels, they were very upset. I just like to make sure everyone is aware of the pros and cons to the Island experience. It isn’t Disney World, yet I’ve been surprised at how many people have that expectation. It is important to us that our guests have the best experience possible. Again, depending on the ages of your kids, it may be ok. There is just a lot more to consider when we rent to the Island with families in mind. I’ll admit that it wasn’t the easiest place to be when we had our 5 year old with us. It's getting easier each year, though between 1-4 years old, it was huge challenge. Our little Luke loved to explore and wander. There are steep parts of the island. We just have be extra-vigilant when he is there. Dock: The docks are floating docks. Due to the fluctuation of the river levels, we are not able to control, yet do our best to control the placement of the docks. 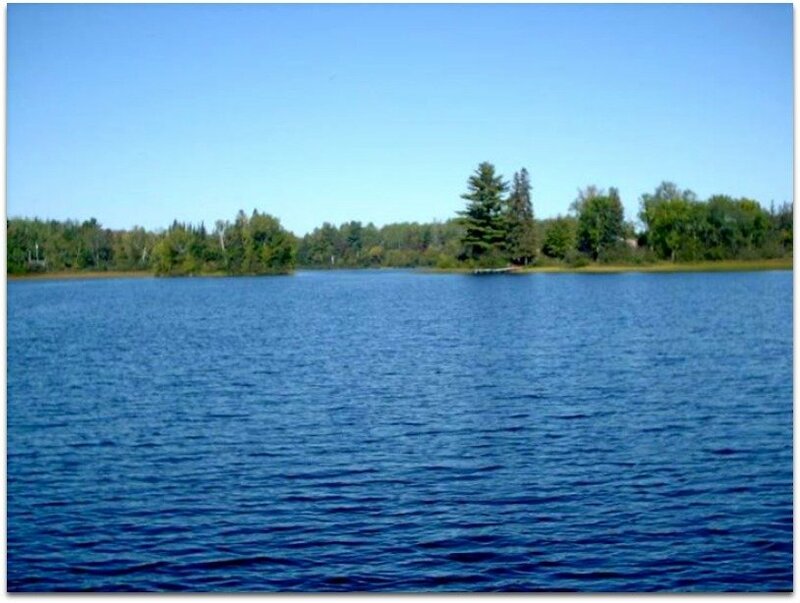 During the late summer/fall, and the Michigamme River can be low and muddy. We advise you to please bring boots, plus your patience between mid-August and October. Fishing: Generally the Island has very good fishing. Small mouth bass, walleye, perch, pike and pan fish are what most of our guests report catching. If you are a trout fisherman, trout can be caught in the upper Michigamme River. Most tributaries have brook trout that flow into the Michigamme, yet it is not a trout stream per se. 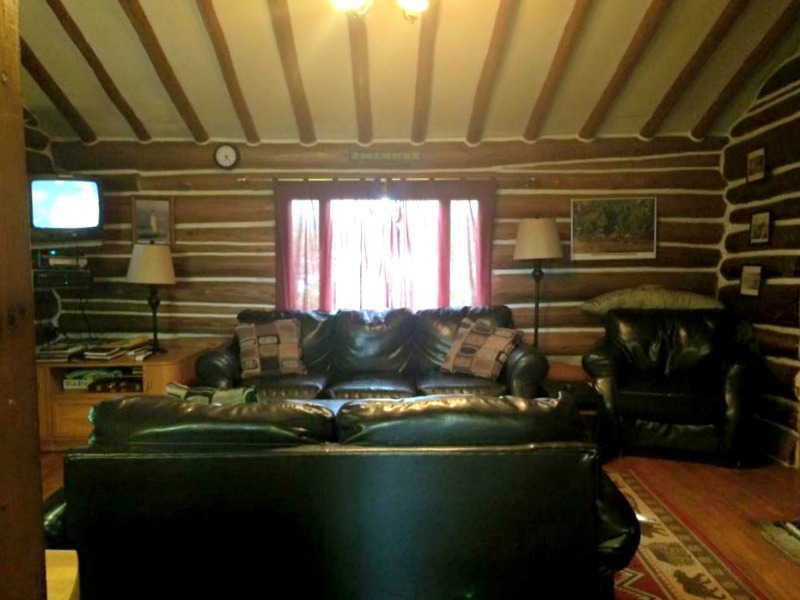 I would recommend our Tioga Falls Cabin if you are interested in trout fishing. Fishing poles: I would advise you to bring your own fishing poles to the Island. While you may be lucky and find one or 2 there, we can't guarantee any will be there upon your arrival. Grill: Brand new charcoal grill in 2017! You may get lucky if the previous guest left some, but to be safe we suggest you pick up charcoal on your way there.We actually have both an electric grill and a charcoal grill. Grocery Store: The closest, full-sized grocery store is about a 1/2 hour drive from the cabin, Ishpeming. It is the IGA Jubilee right on U.S 41. If you are driving from Wisconsin/Chicago, the last grocery store is in Iron Mountain. There is a little store in the town of Republic, about 15 minutes from the cabin, yet there isn't a large selection, and the prices are convenience-store equivalent. There is a larger convenience store/BP Gas station on the corner of U.S. 41 and MI-95, about 20 minutes north of the cabin. Hammock: We do have a hammock on the Island. I love it! Enjoy! Internet: Wi-fi is on the Island! Personally, I do think it is good to disconnect from technology for a while, yet I listened to our guests and realized that many do need to check in with work while they are vacationing. Parking: You can either park your car in the off-road parking spot or alongside River Road. We highly recommend that you pull into the parking space, just in case one of the logging trucks drives by. Still, you can park roadside adjacent to the path leading toward the Island. Pets: *Pets are welcome! Freshwater Vacation Rentals currently charges $50/per pet. Yes, we do accept dogs, yet we do ask that you please clean up after them both inside and outside the cabin. Plus, if you allow them on the furniture, we do ask that you please bring your own linens/blankets for them to sleep on. Just let us know which bed you will be using with them, and we’ll make sure it is ready for your sheets when you arrive. Plus, if the pet hair starts to build, we do ask that you please run the vacuum. Generally, dogs love the Island with all the water and places to explore. Their food does tend to attract mice, so vigilance is needed. Space: Our 1100 sq. 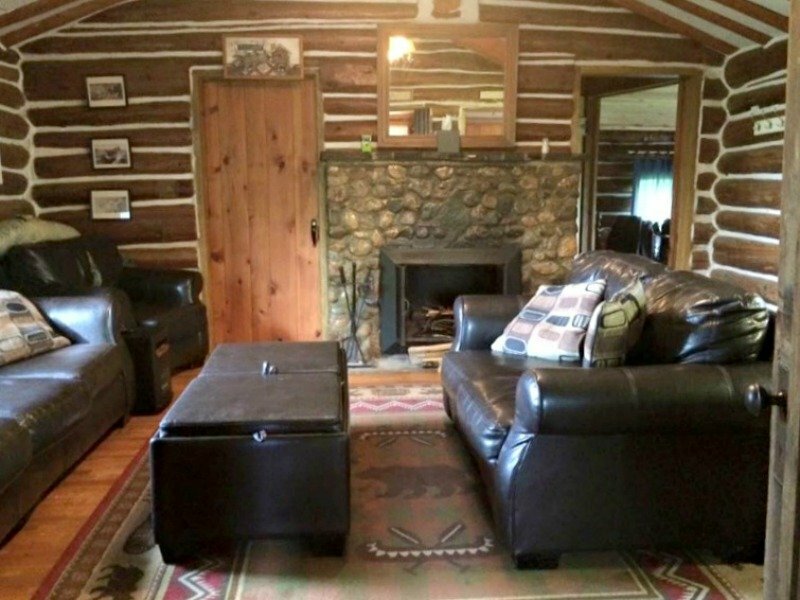 ft. log cabin on a 2 acre Island, it is ideal for 2-4 people. It is considered very tight for 6 people, and therefore I do not recommend 6 people on the island together. The island experience is unique in that it brings out the true essence in people when they truly have a chance to get away from it all. Still, six different personalities, especially if they aren't in one family unit can bring out conflict. There are people who feel claustrophobic on an island, even though you can literally see your car 300 feet across the river. It takes about 5 minutes to get across in the boat. We have always had very positive feedback from couples and small families. It's an ideal, private get-away. 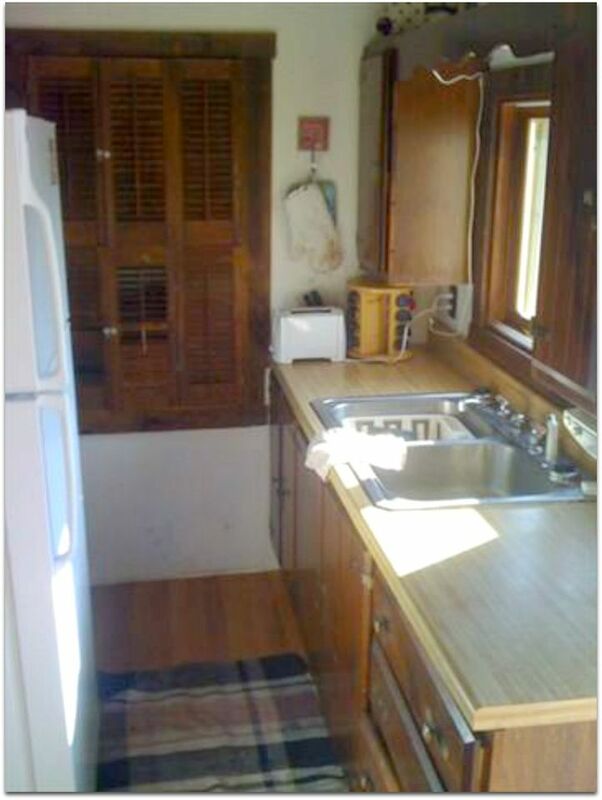 Washer and dryer: No. It's on my wish list. Wood: Yes, we provide firewood for Republic Island. We will leave you a handful of started logs on the Island. Once you have burned through the starter pieces, you are welcome to get as much wood as you need during your stay in the parking space on the other side of the road, across from the Island. 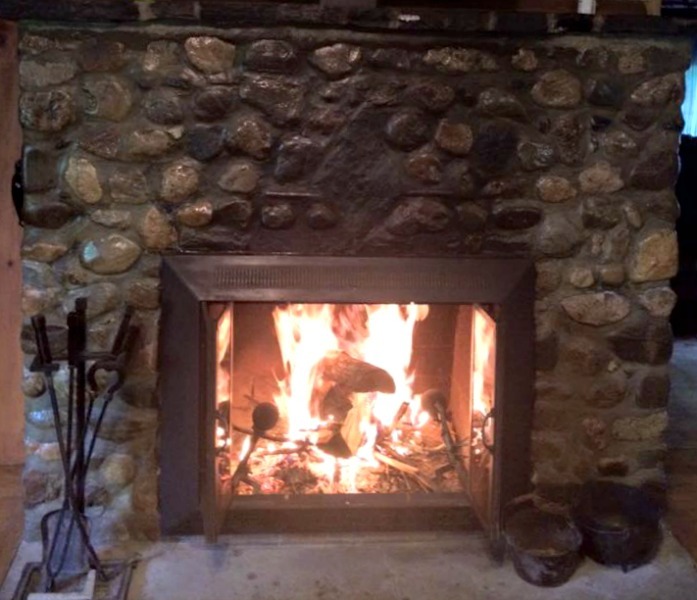 We ask our guests to please let us know if the wood pile is getting low so we can order more wood. Everyone uses firewood at different speeds. 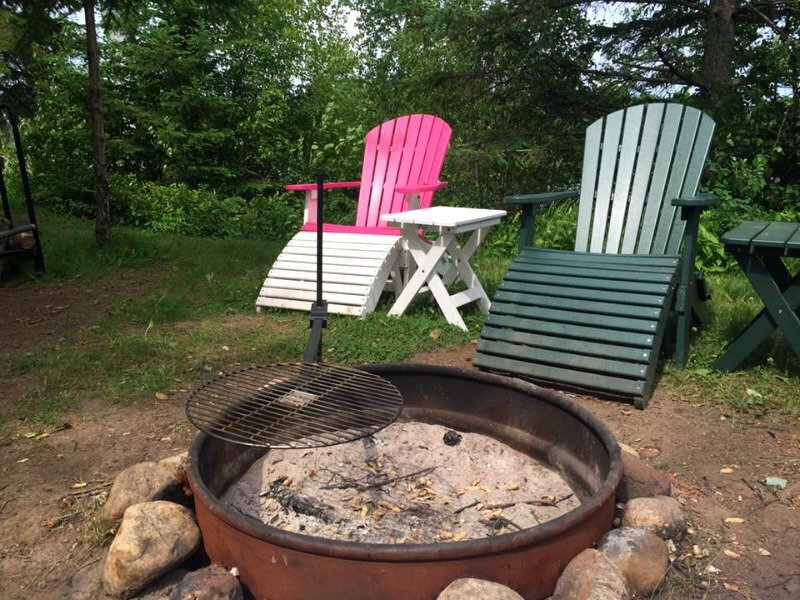 Please note: We have had guests find it too taxing to carry the firewood back and forth. From personal experience of carrying a chord over, it can be taxing. Therefore, we are offering a face chord of wood to be delivered directly to the Island for you for an additional $100. Please let us know if you are interested in this option. A fun stay in a lovely woodsy environment. Republic Island is a pretty cool place, especially if you want privacy. We're so happy that you enjoyed it. Great place to get away from it all. We had a great time being in the middle of the U.P. and still having some of the creature comforts like WiFi and tv. 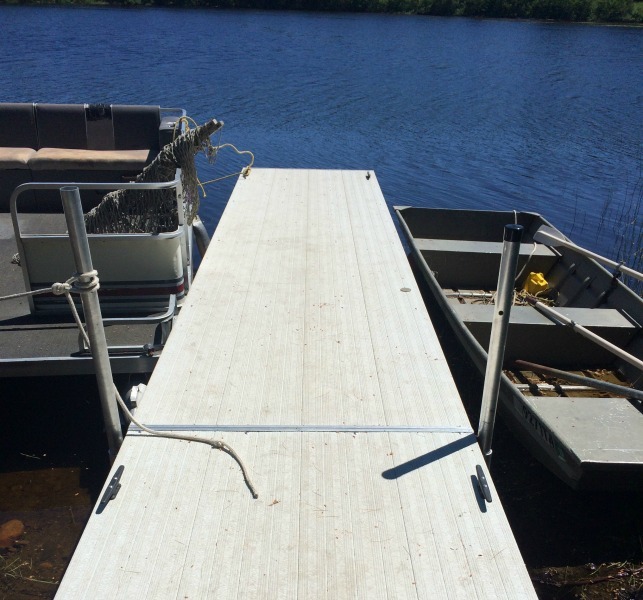 The fishing was good and the pontoon was a great platform to fish from safely. There is a large small mouth bass that hangs to the left of dock, he got away twice before I could get the net on him. He had to be at least 20 inches. We walked a trail off of River Road and picked a bag of wild blueberries and raspberries. The island is also centrally located so we were able to take a couple of day trips and explore some of the sites of the U.P. Peter, it sounds like you had a great vacation, and we're so happy that Republic Island was the perfect place for you. Small mouth bass, wild raspberries and blueberries sounds like the perfect meal! We look forward to seeing you again. 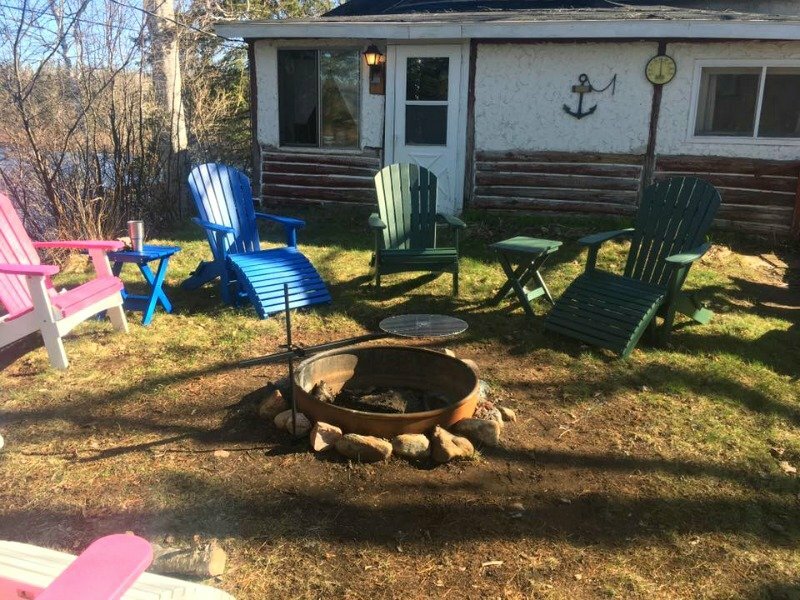 I know there are other reviews and comments about bringing children to the island, but from a family who normally tent camps for summer vacation, this was the perfect getaway! We arrived to the island to find everything we needed and more! The bedrooms each have full size beds so there was plenty of room for all of us. Everyone quickly claimed rooms and began exploring the island. 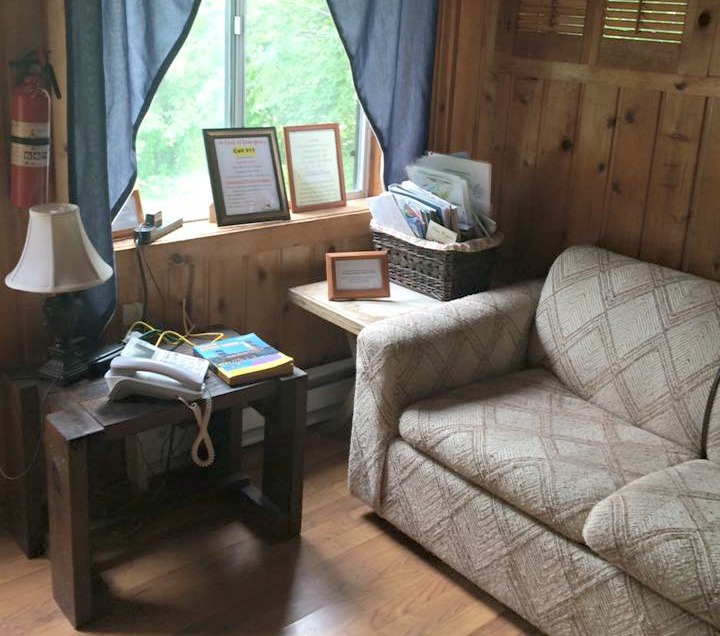 The cabin is simple and rustic and filled with local history and history of the island as well as interesting photos throughout the cabin. 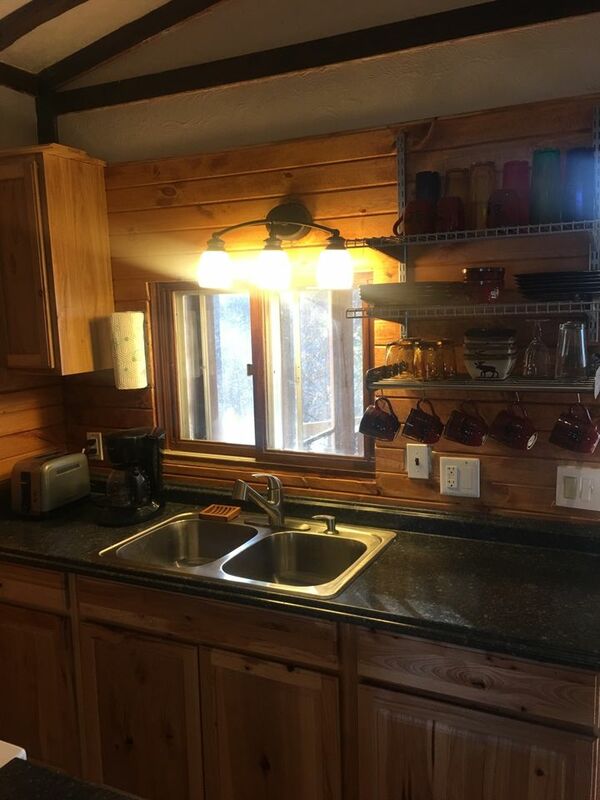 You can see the river from almost every window! 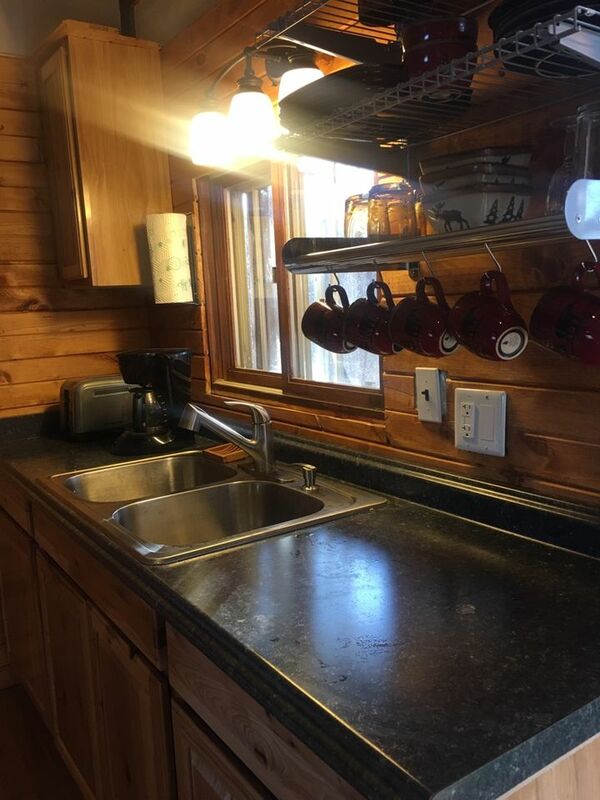 The cabin came stocked with everything we needed to get through the week with cooking utensils, a coffee pot, grill and even games and reading material. We even found a high chair under the deck to use for our youngest! There isn't really a place to swim right off the island, but we found that the river gets deep enough in a couple places to swim off the row boat, there is also a beach a couple miles down the road, or a state park about 30 minutes away to go swimming. We ate all our meals on the screened in porch and spent every night around a camp fire roasting marshmallows. The cabin does have a very nice flat screen TV which we used maybe twice to let the kids watch some morning cartoons while my wife and I got ready. There is a canoe which we used several times to explore around the river, and my son used the flat bottom boat for fishing every day! We only used the WiFi to send pictures to friends and family. You really do need to be an outdoors family to enjoy the island and even with the TV and WiFi, it is very rustic, yet beautiful. If your kids aren't able to easily entertain themselves by exploring or fishing, then this probably isn't the location for you, but for my family this was 100% the right place! By the end of the trip, no one wanted to leave. All our kids said this was the best family vacation we've had yet and my wife and I agree. We made reservations to come back next year before we were halfway home and foresee many years of summer vacations at the island! Thank you to the hosts for providing such an amazing location to share! The island brought my whole family closer and we can't wait to come back! Jeffery, your review made my day. This is the perfect review of Republic Island for guests considering coming to the island to read. I could actually visualize you all being there, and I love that your kids said it was the best vacation ever! Knowing that you are coming back next year, and hopefully for years to come, says it all! We stayed on the island the week from 6/23 to 6/30/18. This was our 2nd time staying on the island. It was perfect this year for us since we brought our dogs (as usual) and our grandbaby. She is 1 1/2 years old and absolutely loved being able to run outdoors and be on the boat. The fishing was great this year. We caught walleye, perch, crappie, small mouth bass, pike, and rock bass. The biggest pike was 32" and made Mark's day! Our dogs love the ability to run and explore. They enjoyed chasing the snake and the chipmunks. They always enjoy the time on the boat. 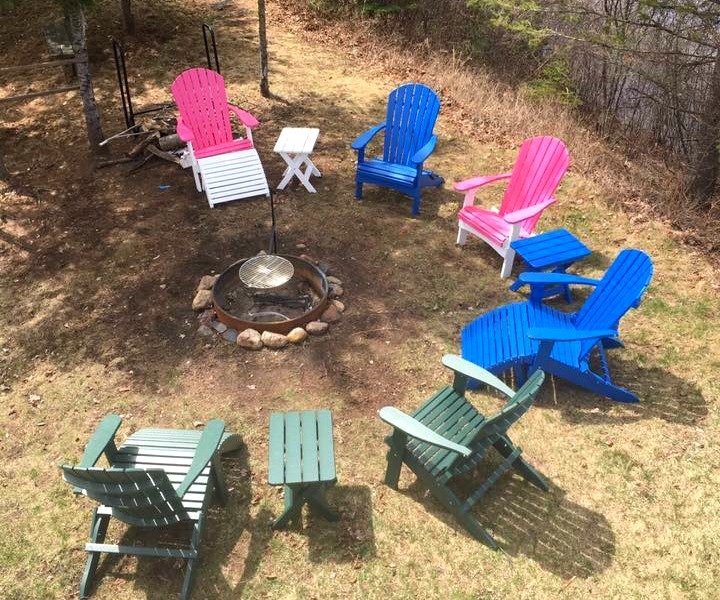 This was our 3rd year using Freshwater Vacation rentals and look forward to next year! We love our returning guests, especially when they appreciate the joy of Republic Island like you do. Your little grandbaby is so lucky to have you as grandparents, who take her into nature for vacations. Between your pups and the fish she watched you catch, she will have many happy memories of Republic Island. Thank you for letting us be a part of those memories! We stayed on the island the week from 6/23 to 6/30/18. This was our 2nd time staying on the island. It was perfect this year for us since we brought our dogs (as usual) and our grandbaby. She is 1 1/2 years old and absolutly loved being able to run outdoors and be on the boat. The fishing was great this year. We caught walleye, perch, cropie, small mouth bass, pike, and rock bass. The biggest pike was 32" and made Mark's day! Our dogs love the ability to run and explore. They enjoyed chasing the snake and the chipmunks. They always enjoy the time on the boat. This was our 3rd year using Freshwater Vacation rentals and look forward to next year! Chantel, we love having you back! Republic Island is the perfect place for your dogs, and I'm sure that your grandbaby was in heaven. Having freedom in nature can not be beat. And the fish, oh my goodness what were you using for bait? Way to go. Mark needs to get an award for that pike. See you next year! We spent a wonderful week on Republic Island in mid-June. The cabin was great and had lots of charm. We thought the best place to hang out was the screened in porch on the back of the cabin. The heated floor in the bathroom and on-demand hot water were well appreciated on chilly mornings! 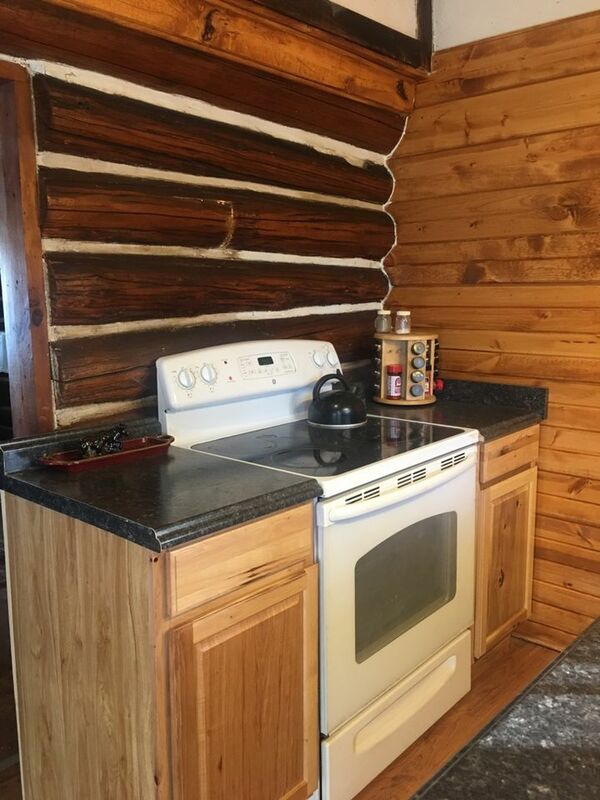 The cabin is accurately labelled as for the adventurous. We were happily isolated from all human activity and thoroughly enjoyed exploring the river by boat and canoe. The fishing was also excellent! Two pieces of advice for future travelers. 1. Bug spray. 2. If the electric motor on the pontoon suddenly quits, there is a red breaker switch that can be snapped back into place which is mounted on the back wall of where the batteries are stored under the pontoon seats. Sarah, Republic Island is truly the place to go to get away from everything. We're so happy that you enjoyed your stay. That screened in porch is the best! Thanks for your advice, especially for the pontoon. I very much enjoyed my stay. It was as unique a vacation experience as I have had, being so close to home. 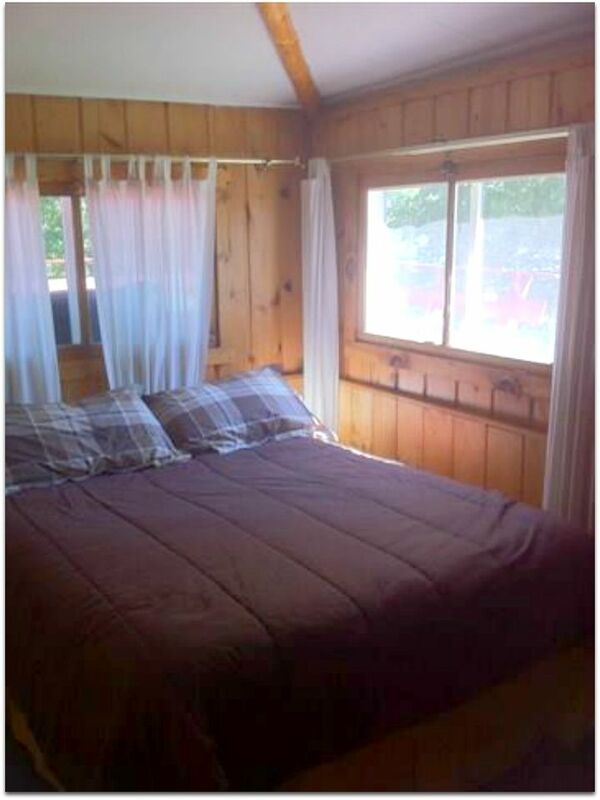 It was a very cute and well kept cabin, and had a surprising amount of amenities. I did experience some issue with the pontoon boat, as the push pole was cracked, and the first time I went to use it, the end broke off, cutting my hand. Aside from that, the experience of using the boat to get back and forth was quite fun. I did leave some Kerosene and recreational fuel there, we had to get some to start the campfires, as the wood still had alot of moisture in it. 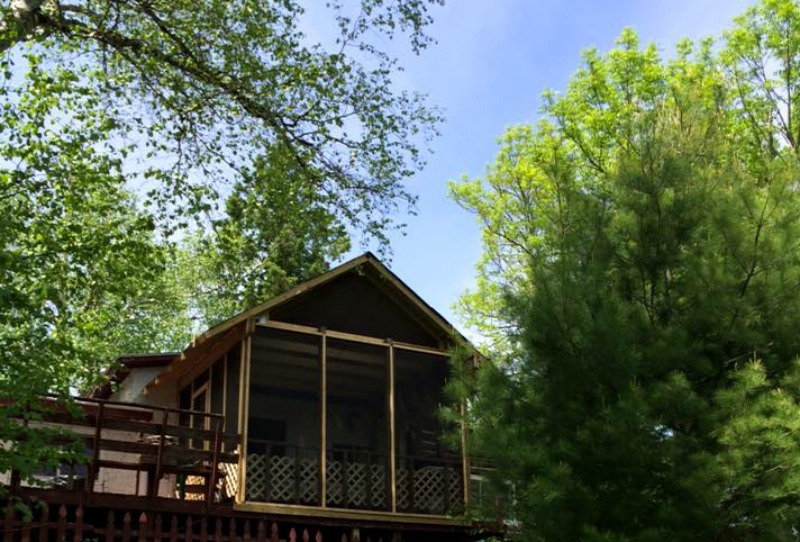 I hope to be able to rent this cabin again in the future, as it was very enjoyable. We are thrilled you enjoyed your adventurous stay! Sorry to hear of the pontoon incident. We will get on maintenance right away. Thank you for leaving the Kerosene...yes, wet wood is troublesome. We are happy you enjoyed your stay! Wow...sounds like Wild Kingdom up there! That is so cool to enjoy nature in that realm. Thank you for letting us know! We hope to host you again :) Let us know your dates, we are already taking bookings for 2018 at the island. A wonderful bit of seclusion. We enjoyed the quiet, the river and the peacefulness. I would stay up by the fire and here the mysterious sounds of the UP at night and wonder what they were caused by (sometimes a little scary). The only downer was our last full day there when I decided to fill up the car with gas before we left in the morning. I was about 10 feet from the River Road dock when the electric motor on the pontoon quit. The wind and the current quickly took me down river. I drifted past the cabin and fortunately my wife was within hearing distance and I told her what had happened and to call the number left for emergencies. To make a long story short I figured out the circuit breaker had trouble staying connected and I made it back to the cabin. My wife and I would like to give a special thanks to Tim. He came to my rescue and was exceptional with his generosity and helpfulness. He went out of his way to help us with our luggage and make sure we made it to the car the next day without floating down the river. He is a very very nice man. We LOVE Tim too! Nothing like a little adventure down the river! We are happy it all worked out and you enjoyed your stay. Thank you for booking with us! We are taking booking for 2018 already, so let us know if you are interested in future dates! We had eight people in our family stay at the cabin, including two small children and we had a wonderful time. Two people in our group slept in a tent. There was a nice grassy area for the tent. The rest of us slept comfortably in the cabin. We loved the pontoon boat and we all went fishing daily. The young children in our family loved the island and the river. Wood for fires in the fire pit was provided and we had a fire every day. Thank you for a wonderful vacation. It is so nice for a family to enjoy the island. It has so much to offer. Thank you for booking with us. We hope you consider choosing Freshwater for your next vacation!